While January 25th is understood to be the anniversary of the revolution, February 11th also marks an important day in Egyptian history. Two years ago, the incumbent president became the former president when he announced that he was stepping down. The statement was met with jubilation in Cairo's iconic (and now notorious) Tahrir Square. Fast-forward two years. Egypt is still plagued with protests and each Friday becomes an inevitable volley of tear gas canisters and injuries. As the situation deteriorates, a new group of protestors has emerged. Using protest techniques from the 'Black Bloc' which involves destroying property while clashing with security forces, the black-masked protestors attack cameras and those who try to capture their vandalism on film. Making their first appearance January 2013 in Egypt, they have been labelled as terrorists by the Egyptian government. Last night, only a handful of protestors arrived at the Presidential Palace to protest the current regime. For the first few hours, the number of news photographers outweighed the number of protestors. As night fell, small marches arrived. 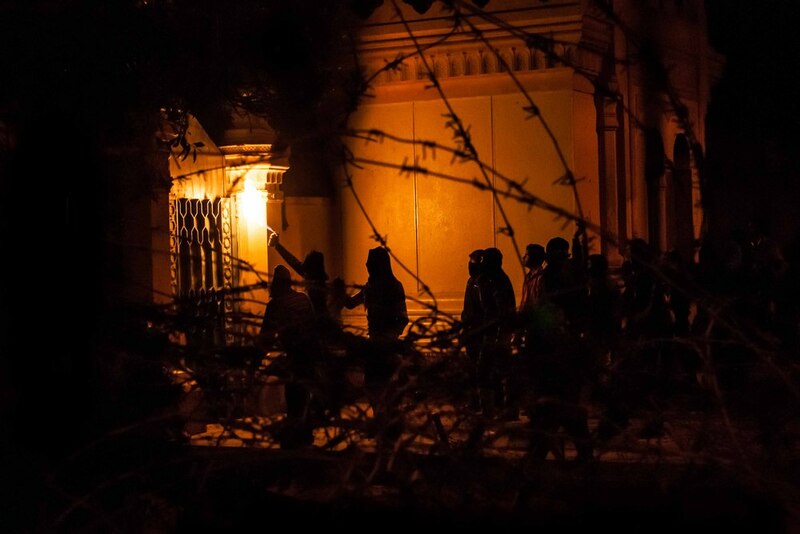 Black Bloc members then tried to pull back the barbed wire around the palace. Fires were soon lit around the gates, and rocks hurled over the wall to the guards behind. Water canons were used to disperse protestors, although they did little to mitigate the stones being thrown over and at the wall. The sound of sirens was soon heard, followed by the bangs of tear gas grenades. The police quickly swept in, arresting protestors and clearing the streets with a barrage of tear gas shots. 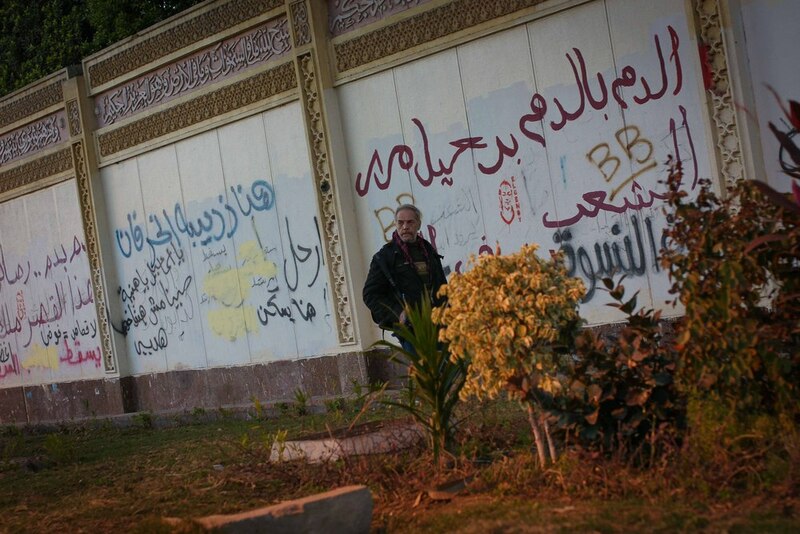 Graffiti has been drawn all over the Presidential Palace walls by protestors. This is the de facto suit-and-tie combo for news photographers in Cairo. A French photographer surveys the growing crowd. He helped me out a lot during the clashes. Nothing beats a veteran's experience in the field. News photographers wait for the crowds to grow. For the early part of the night, it became photographer social hour. The anger, after two years, is still very much present. A protestor calls for the fall of the regime against the backdrop of the Presidential Palace. Members of the Black Bloc attempt to burn the main gate of the palace with a spray can and lighter. The protestors were able to also breach the barbed wire barrier. 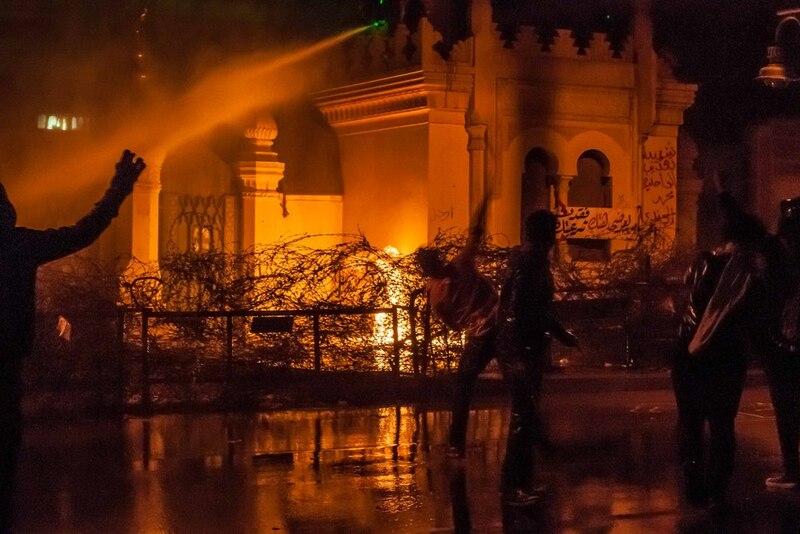 Protestors hurl rocks at the palace as water canons fire at protestors. A member of the Black Bloc taunts the guards firing the water canons. One of the few times it rains in Egypt. Or at least water comes from the sky. Some kids as young as 9 or 10 were hurling rocks at the walls. Members of the Black Bloc set fire to another gate at the palace. Moments later, the police moved in. Tear gas wafts towards protestors as they prepare to engage the police. 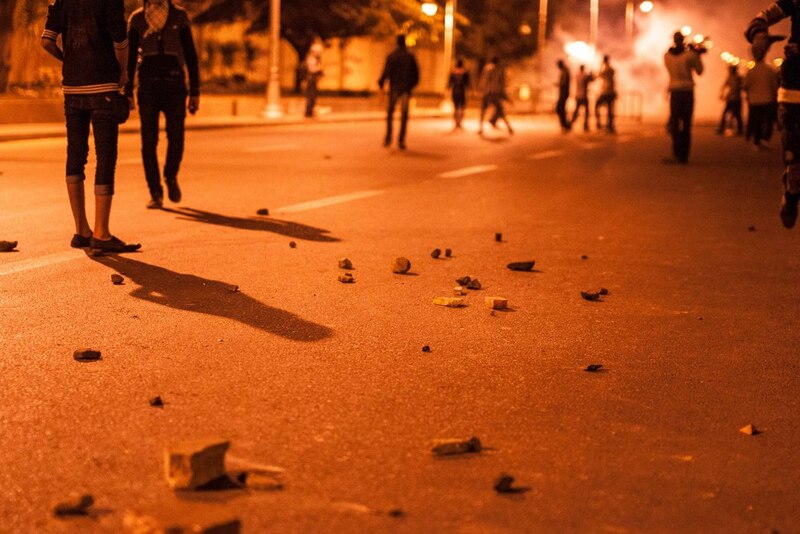 Since the palace is beside the tram tracks, stones and chunks of cement are taken from there to throw at police. And this is when I left. I'd rather be safe and with a camera, than the opposite of that.